I have two children, a daughter of 14 and a son of 12. And despite all of my attempts to parent in a gender neutral way, they are as different as chalk and cheese…. My daughter starting asking “those questions”, about puberty and growing up and stuff when she was about 7. But then she started to develop the first visible signs of puberty when she was 8 so that was the right time. I bought her the lovely little Usborne book “What’s happening to me?”, which explains things in childish terms, and allowed her to come to me with questions as she needed to. All very simple and straightforward, especially as I remember exactly what it was like to be a teenage girl, in gory detail, so we were able to have some pretty frank discussions. But my son? That’s a different story. I had no brothers growing up, no male cousins nearby, and from the age of 11-18 I went to an all girls school. I know precisely nothing about teenage boy puberty! And their dad is at work all day until late, so you can guarantee he won’t be there when the awkward questions come. I was going to buy my son the equivalent Usborne book at the same age, but he just wasn’t the slightest bit interested or curious. And when the changes did start to happen for him (in year 7), the book I had in mind just didn’t seem enough somehow. So this lovely Dorling Kindersley guide, Help your Kids with Growing Up has arrived on my desk at exactly the right time. 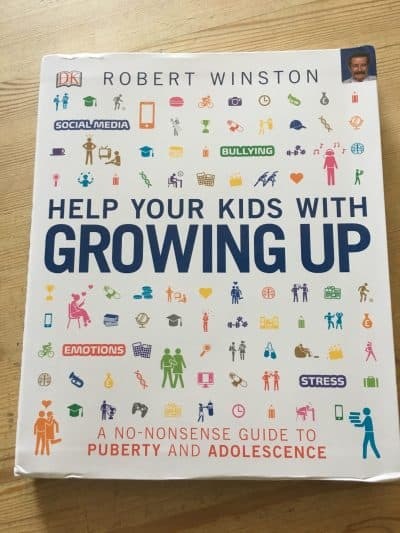 It’s been put together by Dr Robert Winston, our favourite TV scientist, and bills itself as a no-nonsense guide to puberty and adolescence. And it really is jam packed with useful information, in a very easy to read style with lots of pictures and diagrams. This isn’t the sort of book to read from cover to cover, but it is the type of book that I think I will pick up and refer to quite a lot, and possibly show a few pages to my boy now and again. This can be a tricky one for some teenagers. I was really pleased to see that the male puberty section had a section on how exactly to wash and look after boys’ bits, because that was one area that I really wasn’t looking forward to explaining….. 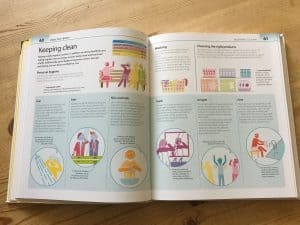 The book explains in detail what needs cleaning and how often and with what products – very useful for the reluctant teen…. I’m pretty clued up on all things online, as I live my life in that space all the time. My children are very aware of how closely I monitor them, and know how to behave carefully online. But I suspect this section could be useful to some parents who are less sure of themselves. 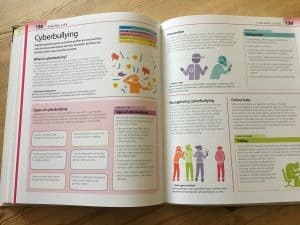 Even with my vigilance, both children have come across things online which we all wish were not there, so it’s nice to have a framework for discussion when bad things happen. It’s sad that so many of our young people have mental health issues themselves, or will be exposed to people with them at secondary school. Between the rigours of our education system and the contant pressure of the online world modern young people are exposed to stresses which I could not even imagine. 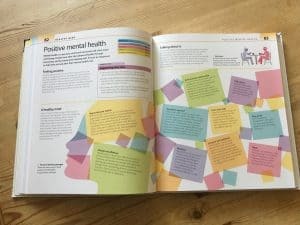 There are pages on stress, anxiety, depression, confidence, self esteem and resilience. This is all very useful for parents and for the teens themselves. 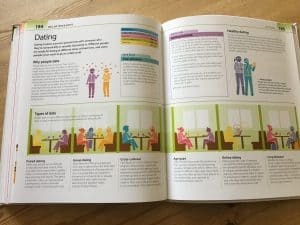 I really like that in the dating section, no gender is mentioned, and the figures pictured are deliberately androgynous. This page just talks about dating, what it is, what it means and whether you should do it – the whole concept of what gender you identify as and what gender you should date, if any, is all dealt with elsewhere. Overall I think this book has the whole of the teenage experience pretty well covered and in a really lovely sensitive, non-judgmental way. I am going to let my children know where this book is and encourage them to refer to it for anything they are thinking or feeling. We do have open discussions about most things in our house, but I think sometimes it’s good to have your weird thoughts validated as normal by seeing them in print in a book by a well respected author. So I would rate this book very highly indeed and think it would be an excellent addition to the bookshelf for any parents whose children are even appraoching adolescence.